The Low Carbon Fuel Standard (LCFS) increases the cost of the gasoline and diesel fuels produced from crude oil by requiring credits to offset the LCFS deficits. Stillwater projects that this program will add another 20 cpg to the consumer price of gasoline by 2020. To date, the LCFS cost has been relatively low, about 4 cents per gallon (cpg) for CARBOB, currently compared to a 11 cpg cost for Cap and Trade for Fuels Under the Cap. However, going forward the cost for the LCFS is expected to grow and overtake the Cap and Trade costs. Renewable and alternative producers and suppliers effectively increase the value of their products by the value of the LCFS credit. The same fuel that creates a credit in California has more value than if that product were sold in a state without a low carbon fuel standard, like Washington or Nevada. Since most of the transportation fuel sold within the State comes from crude oil, and all suppliers of fuels from crude oil are regulated parties in the LCFS program, the cost of the LCFS is a cost that is passed along to the consumer. Therefore, it is expected that any increased cost of the LCFS due to an increase in LCFS credit price will be reflected in the pump price. As such, the LCFS cost is in effect a “hidden tax” on the consumer. This is notable as on April 28 Governor Brown signed SB 1 which, starting in November 2017, raises the excise tax on gasoline by 12 cpg and on diesel by 20 cpg. SB1 includes other smaller fuel tax changes and an increase in vehicle registration fees. This revenue resulting from SB1 will be used for road repairs. Despite the need for road repairs, the tax increases are being fought in some quarters because of its impact on consumers. As noted above, the increase in the LCFS cost will push up consumer prices even more than SB1. Another element that will add to the LCFS cost is the Draft 2030 Scoping Plan currently in the works. The Draft Scoping Plan sets out to achieve the SB 32 GHG reduction goal of 40% less than 1990 levels by 2030. The Draft Scoping Plan presented to the CARB Board on February 16 contained a measure to extend the LCFS to a 18% reduction by 2030. LCFS credit prices will begin to rise in 2018 as the rate of deficit generation approaches the rate of credit generation. In 2019, 2020, and in each year to 2030, LCFS credit prices will be at the Credit Clearance Market price since each year is a net credit deficit. The LCFS will be a straight-line progression to 18% reduction in 2030. The current regulation is treated as extended to 2030 with a linear extension of the standard to an 18% reduction. Changes to the fuel mix and fuel carbon intensities (CIs) are not significant enough to increase LCFS credit generation enough to relieve yearly deficits. The LCFS cost in gasoline as sold (10% ethanol) includes the value of the LCFS credits associated with 79.9 CI ethanol. The LCFS cost in diesel as sold assumes 5% vegetable/soy biodiesel and includes the value of the LCFS credits associated vegetable/soy biodiesel. This assumes no changes as result of the recent Appeals Court ruling, Poet I, on the adequacy of CARB’s rule-making regarding their baseline for biodiesel NOx emissions. This analysis is shown in the figure below. 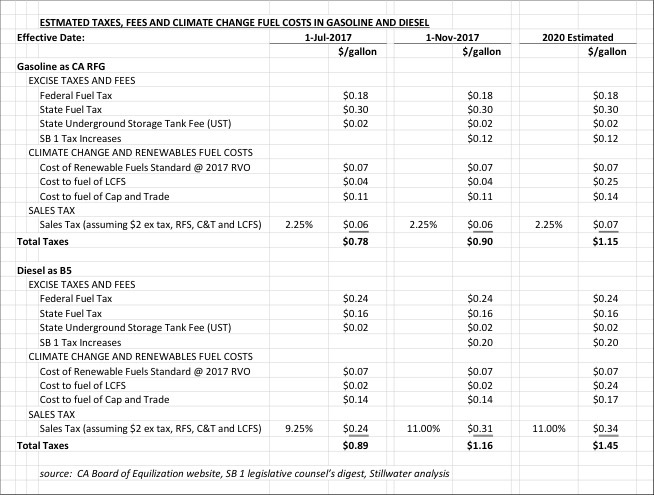 Values shown are for the LCFS cost in the gasoline (CA RFG). As can be seen, the current LCFS cost that is applied to gasoline is about 3.5 cpg today. We expect this to rise to 7.3 cpg in 2018, 18.2 cpg in 2019 and 24.9 cpg in 2020. 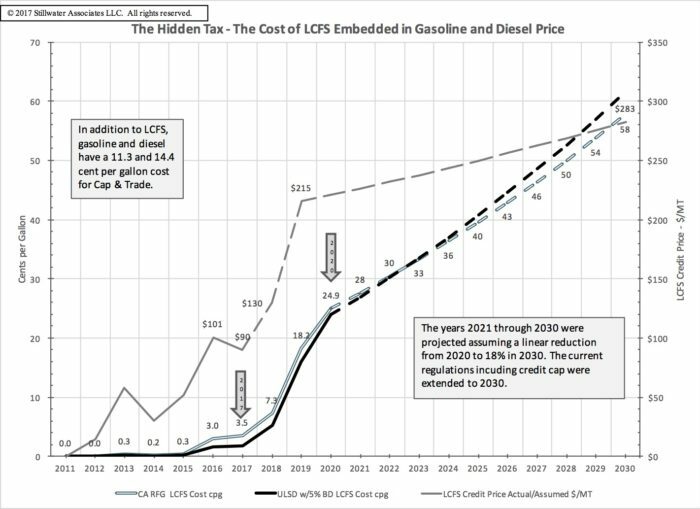 Then if our assumptions about 2030 hold true, the LCFS cost will rise to 58 cpg on gasoline. In the future, the LCFS will increasingly impact (raise) the price of gasoline and diesel fuels for California consumers. So far, this pending increase is not on the public’s radar. Perhaps a closer look is warranted to look at the cumulative impacts of SB1, Cap and Trade, and the LCFS on the price of fuels during the next five years. The automatic inflation adjustment in the California fuels excise tax that is part of SB 1. The impact of future prices for Renewable Identification Numbers (RINs) and the Renewable Volume Obligation (RVO) percentage on RFS costs. Any increase beyond an 8% annual increase of California Carbon Allowances in the cost of Cap and Trade. Local sales tax rate additions that vary by city and county. The following table summarizes the current established taxes and “hidden taxes” in the price of gasoline and diesel, the additional taxes starting in November 2017 when the SB 1 increases become effective, and our forecast for 2020. The enacted taxes and hidden taxes increase by 37 cpg for gasoline and 56 cpg for diesel fuel from June 2017 to 2020. The level of the increase are multiples of the increases in SB 1 alone. Gasoline prices in California are among the highest in the nation, the changes above will extend California’s lead. As some of these costs are legally defined as taxes and others are legally defined as fees that apply to the fuel, there are those who may quibble with the way we have characterized fees as a “hidden tax”. It is our intention with this assessment to provide an illustration of how the costs, no matter what they are called, are built into the price of retail fuel and how that cost will increase over time. We believe this issue needs further examination to inform California consumers. We go into greater detail on these issues in our latest Monthly and Quarterly LCFS Newsletters. Access to Stillwater’s LCFS Newsletter is only available to subscribers. For more detailed information on LCFS data trends and analysis be sure to subscribe!